Let’s campaign and let campaign! 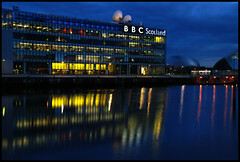 BBC Scotland, a photo by Kasia!! on Flickr. All independence campaigners have been aware of a varying degree of bias in mainstream media (MSM) for a long time. I think many have thought that this was a temporary situation, that things would change once the Yes campaign had assembled enough facts to feed to the waiting journalists. To make matters even worse, it now turns out that the BBC have not been ignoring the first story at all. They have instead been trying to undermine the researcher who created it. Derek Bateman has the full story. What this means is that Yes campaigners can’t wait for the BBC and the rest of the mainstream media to drop their bias. Their recent aggressive reactions make me think it’s quite likely the bias will get stronger, not weaker, as the referendum gets closer. Many voters are getting the vast majority of their information from MSM, so it’s an almost impossible struggle to convince them of the merits of voting Yes if they don’t get information from other sources, too. I know there have been numerous small-scale attempts to make people aware of some of the pro-independence blogs (such as Newsnet Scotland, Wings over Scotland, Bella Caledonia, National Collective, Business for Scotland, etc. ); however, I think this has to become a focus in the next six months. Whenever we speak to undecided voters, we should give them a list of URLs, and somebody should seriously consider raising money to advertise these websites on buses and in Glasgow’s subway. We know for a fact that informed voters tend to become Yes voters. We just need to ensure they get enough information to enable them to make up their own minds.